We don't get much in the way of snow in these parts, so why-oh-why did I open the curtains to a thick covering of the white stuff this morning after spending all night awake with a little boy who managed to cough so much he threw up? Of course he looked out of the window and instantly wanted to go out and play in it. I had to cancel yochien for the day and then we had to walk round to the doctors, there was no way I was going to ride the bike. Luckily he has just a cough and is fine otherwise so he was quite happy to walk round, it is about 10 minutes walk away, so not too bad all things considered. Doc gave us antibiotics, more chest patches, new syrup and put him on the nebuliser for 10 minutes, hopefully this lot will do the trick. The other plus was the snow kept away all the oldies that I am convinced just go to the clinic to hang out, there were only real sick people there. 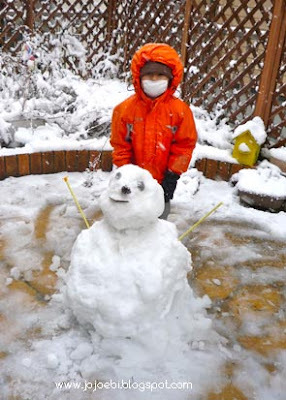 Since he was already muffled up to his eyeballs in his snow gear I promised that we would make a snowman when we got back, so he is a happy choppy now, it is perfect snowman making snow too. The snow is coming down thick and heavy, part of me wants it to hang around for a while but the other part wants my husband to be able to home OK.
Ugh, poor little guy with that cough! My daughter gets something similar for pretty much the entire duration of winter (which is long around here). It drives me batty, but there's not much we can do, not even antibiotics and the nebulizer. I hope he feels better though, and that the snow doesn't give your husband too much trouble.